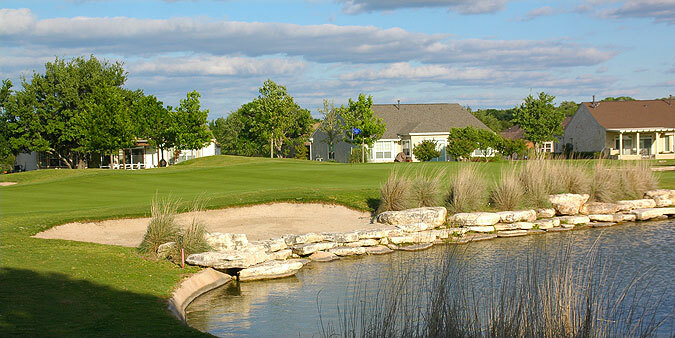 White Wing and Legacy Hills Golf Clubs in Georgetown, just north of Austin, are beautifully designed and meticulously cared for 18-hole championship courses that are part of the Del Webb Sun City Community. Opened for a limited amount of public play, these two courses provide members and guests with private country club conditions from tee to green, and with exquisite landscaping as well. The two courses are located about 2 miles from one another, and each has its own clubhouse with pro shop and restaurant/lounge. Each property also has its own targeted grass range, putting greens and short game are with sand bunker. The Wild Wing property has the most extensive of the two practice facilities. The layouts are well marked, with 100, 150 and 200 yard markers on the cart paths and 150 yard stakes positioned on each side of the fairways of all par fours and fives. Sprinkler heads are measured to the center of the green, and color coded flags indicate front, middle and back pin placements. The Wild Wing course also has 100, 150 and 200 yard markers located in the center of the fairways. The White Wing course features 4 sets of tees that play to distances and slopes measuring 6700 yards/132 slope, 6288 yards/130 slope, 5764 yards/123 slope for men and 123 for women, and 5149 yards with a slope of 114 for men and 122 for women hitting from the forward tees. As these ratings indicate, White Wing is a fair test for all levels of golfers. The terrain is mildly rolling with several tee shots and approaches that play uphill or down, along manicured fairways that while tree-lined, present ample room off the tee. The gently raised green complexes have large, undulating putting surfaces that are protected by mounding and bunkering, with enough recovery room for up and down opportunities. There are 55 soft sand bunkers and water comes into play on just 1 hole - the par five ninth, which is the course's number one handicap. A pond has to be carried from the back tees, and another hazard rests tot eh right of the green on the approach. This is a beautiful golf course that winds through the residential community , and one we highly recommend. For more info, visit our page for White Wing, with direct link to their website by clicking here.